that live completely in flight. and die also in their flying. Click here to read the rest of In Flight. 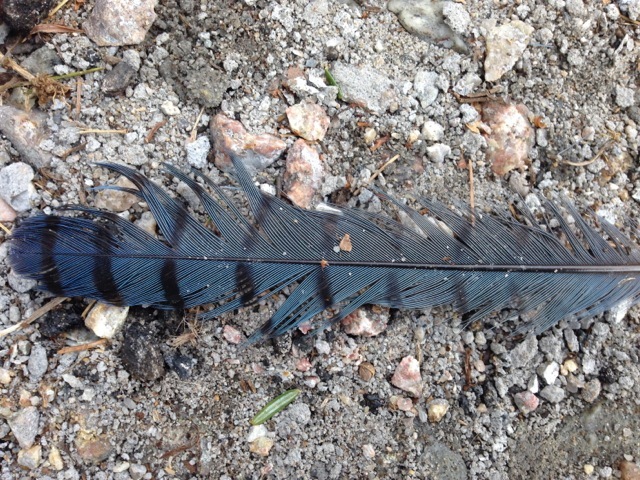 Note: This feather is from a blue jay, and it was 6-7 inches long. Welcome to a new Poetry Friday, this week hosted by Elementary Dear Reader. Thanks, Suzy. So many wonderful poets out there, sharing great words. soon. And then I am looking forward to a relaxing summer. Happy to welcome spring here. Lots of fun plans for summer already. I like dreams of being a bird of being like a bird. Your words were inspiring and beautiful, Brenda. Your sharing Jennifer was very nice, too. smiles! I just entered the library and there were the cutest little sparrows, one looked like a baby bird, so petite and it was chirping so shrilly. I feel it is too early for baby sparrows, but love the idea of birds in nests. Also, I have a collection of feathers, one cardinal, one blue jay, a sweet little down feather from the underbelly of a duck and one long brown pheasant feather I use in my Autumn arrangement. My last real boyfriend, not just a date, liked to go fishing and he waded out into the stream in the Spring and got this one for me. Hope the pheasant was still okay… I like your poem and re-read it today. Yes, having a bird name is fine with me, sometimes it suits me, too. Smiles! I love your poem dear Brenda… Memories of being a bird… And then being able to fly again… Beautifully penned, as always. To take flight is magical, to be in flight is enchanting. Imagine that being born that way! Yes, fabulous: soaring and turning above the Himalayas every moment of your life. I love this. It’s truly wonderful. Ah, your spirit soars naturally, light as a feather. Thanks, Jonathan! To fly in the spring is the very best thing! I always do fly in my imagination, it’s true! Thanks, Line! It’s the prettiest feather I ever found. Yeah for magic!